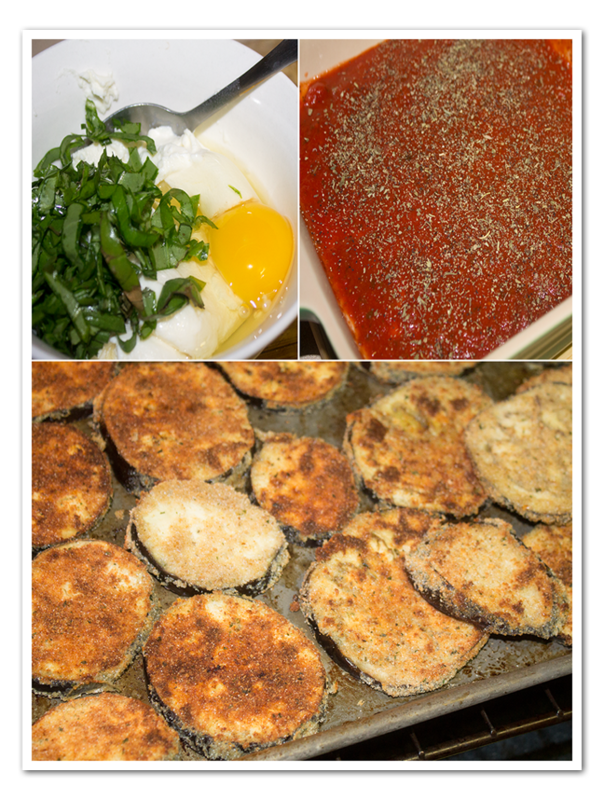 First time for me to prepare Eggplant Parmesan. And I must say it was really good. I am not a vegetarian but I don’t mind to eat a main dish without meat. 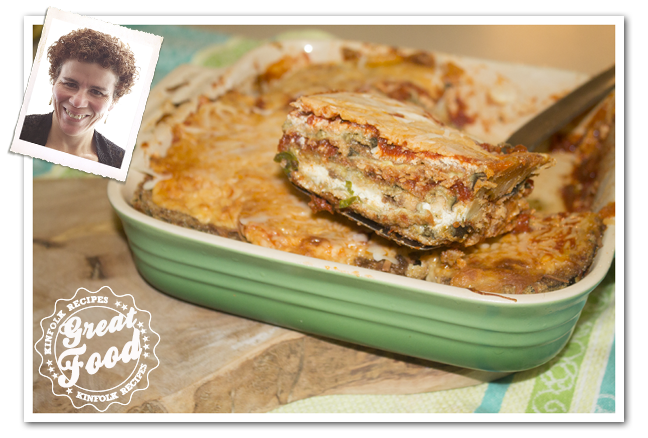 Wanda was nice enough to share this recipe with me and now I am sharing this recipe with you. I did make a few changes to her recipe. I did not use parsley, instead I used basil. Breaded the eggplant instead of baking them “naked” 🙂 Thanks Wanda for the inspiration. Preheat oven to 375º. Wash and slice the eggplant. 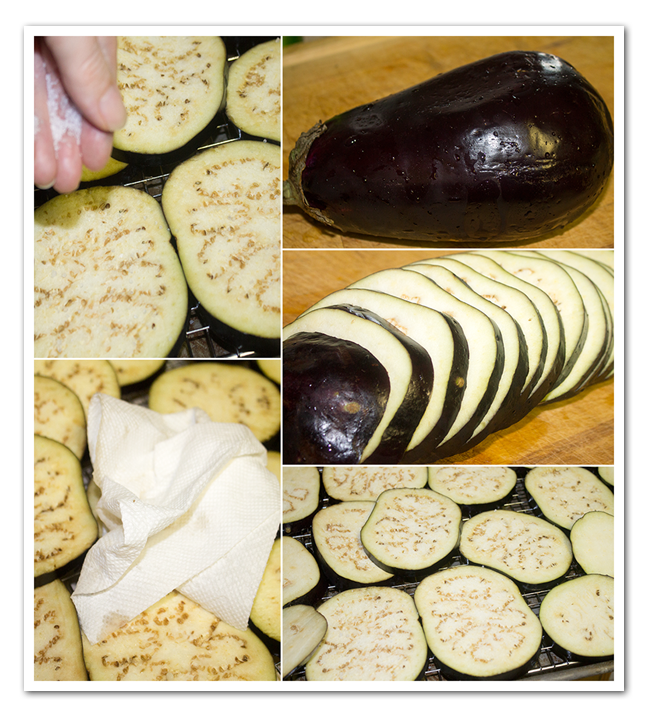 Place the sliced eggplant on a rack and sprinkle with salt, rest for about ½ hour. The salt helps draw moisture out of the eggplant. Dry each slice with paper towel. Instead of frying the breaded eggplant slices, I baked the eggplant in the oven. Breading them the following way: flour –> egg –> bread crumbs. Sprinkle with olive oil each slice. 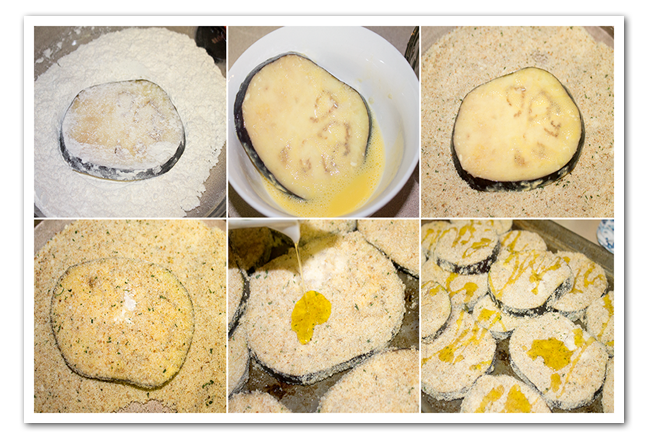 Place it in the oven and bake for 15 minutes, turn over the eggplant slices and bake again for 15 min. In the meantime, mix your ricotta cheese,basil or parsley and egg. Once the eggplant is cooked, then put the pasta sauce in the casserole dish. 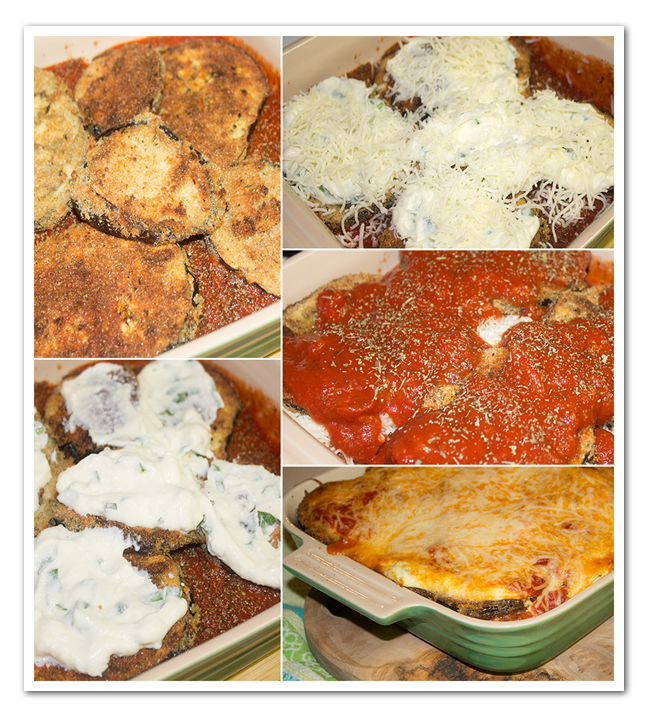 Layer the eggplant in the casserole dish and top with the ricotta cheese mixture, Mozzarella and Parmesan. Repeat the eggplant layers, ending with sauce, mozzarella and Parmesan cheese. Cover with foil and bake at 350ºF for 30 minutes. Allow to set about ten minutes before serving. Preheat oven to 375º. Wash and slice the eggplant . Place the sliced on a rack and sprinkle with salt , rest for about ½ hour. The salt helps draw moisture out of the eggplant. then dry each slice with the paper towel. Spray the baking sheet with non-stick cooking spray and lay the slices on it. Instead of frying the breaded eggplant slices, I baked the eggplant in the oven. Breading them the following way: flour –> egg –> bread crumbs. Sprinkle with olive oil each slice. Turn each slices over and repeat the same procedure. Place it in the oven and bake for 15 minutes. Layer the eggplant in the casserole dish and top with the ricotta cheese mixture, mozzarella, Repeat layers, ending with sauce, mozzarella and Parmesan cheese. Cover with foil and bake at 350ºF for 30 minutes. Allow to set about ten minutes before serving.